Some say a sales team is only as good as their sales stack. So, your startup not only needs to hire talented sales reps, but you also need to arm with a reliable, scalable sales stack that empowers them to excel. Fortunately, you don’t need to pay a fortune to build a powerful sales stack that sets your startup up for success. In fact, you can get everything you need for $29/month! 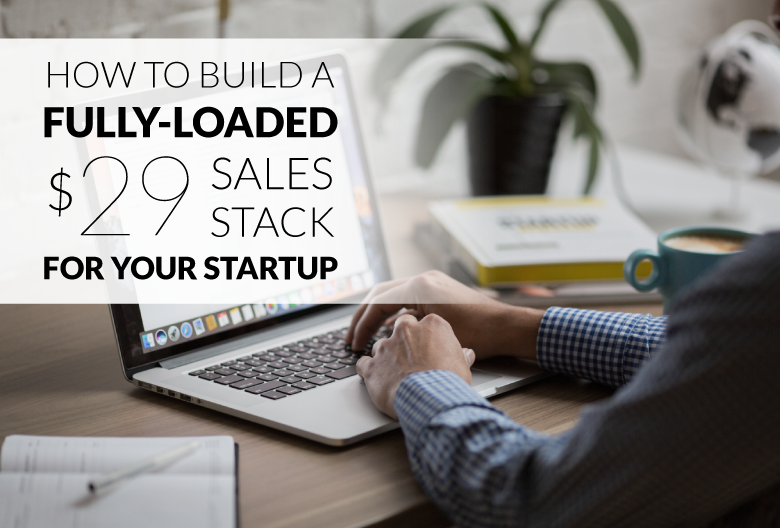 Today, we’ll discuss how you can put together a fully-loaded sales stack and suggest an affordable, scalable stack you can start using right away. A sales stack is the collection of tools used by your sales team. Usually this consists of one or two key tools at each stage of the sales process. With so many possible tools to choose from, how do you know where to even start? Your sales tools do not define your sales process. Rather, your sales stack should support your reps’ existing process. There’s no value in adding a tool to your stack if it doesn’t fit into your sales team’s workflow. So, before you put together your ideal sales stack, you need to understand your sales cycle. Start by reviewing your sales process, determine where you need to improve, and how prospects can be moved through the process more smoothly. For this step, you should look for a tool that helps you find qualified leads. Furthermore, cost is an important factor since you don’t want to be spending more than is reasonable on a new lead. This means making sure the cost per lead falls well within the amount budgeted for your customer acquisition cost. Of course, there are a few other things to consider, like how long it takes to return data, the number of leads it provides, and what percentage are sales-qualified leads who are ready to buy. Analytical CRMs focus on testing, analyzing, and optimizing various aspects of your outreach campaigns and sales process. Operational CRMs offer features that streamline day-to-day operations and automate parts of your pipeline, including lead nurturing and customer acquisition. Collaborative CRMs facilitate communication between team members, allow sales and marketing to work together to qualify leads, and ensure all your reps have access to accurate, up-to-date customer information. A successful sales demo often relies on fool-proof scheduling app that makes it easy to book a meeting with your prospect. The tool should offer a reliable, convenient way to mitigate the risk of double-booking. When choosing the best scheduling tool for your team, consider how easily it integrates with your calendar. Furthermore, does it allow you to give prospects control over which time slot they book? When it comes time to seal the deal, your top priorities are negotiating and signing the agreement. An ideal tool for this stage should allow you to create and send secure proposals (to multiple contacts, if necessary) as well as make it easy for new customers to reply and sign the offer. What Does a Startup’s Ideal Sales Stack Look Like? Well, it needs to be scalable. 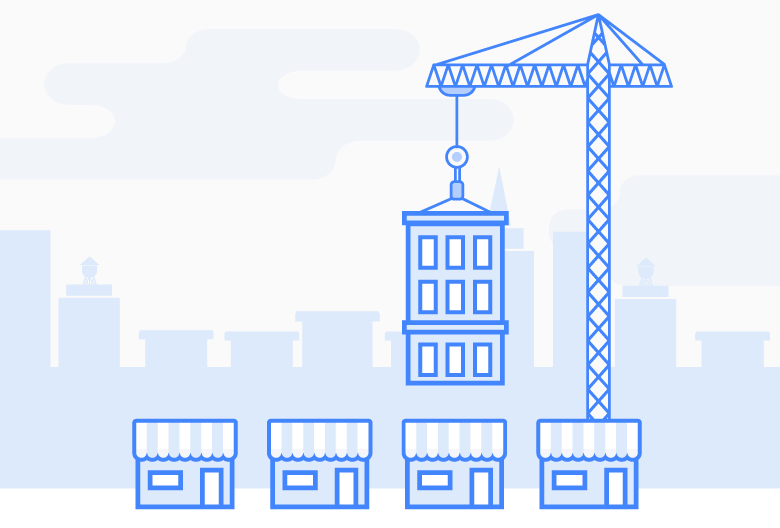 Any tool you introduce to your team at its current size needs to work on a bigger scale, too. Because if all goes well, you’ll experience rapid growth in the foreseeable future. As a startup, you need to be very conscious of how you allocate your resources. We’re talking time and money. Your sales stack needs to be affordable and fall well within your budget. The tools you give to your sales reps also need to be easy to use so they don’t waste time learning complicated software instead of selling your product. Additionally, your sales stack should be complete and powerful. It needs to not only get the job done, but get it done well. Your stack should be engineered to boost your team’s organization, productivity, morale, and closed-won rate. As for what specific tools are in a typical startup’s sales stack? Here’s what we recommend. If you’re looking for a scalable, reliable, powerful sales stack that fit into your budget, we’ve got you covered. 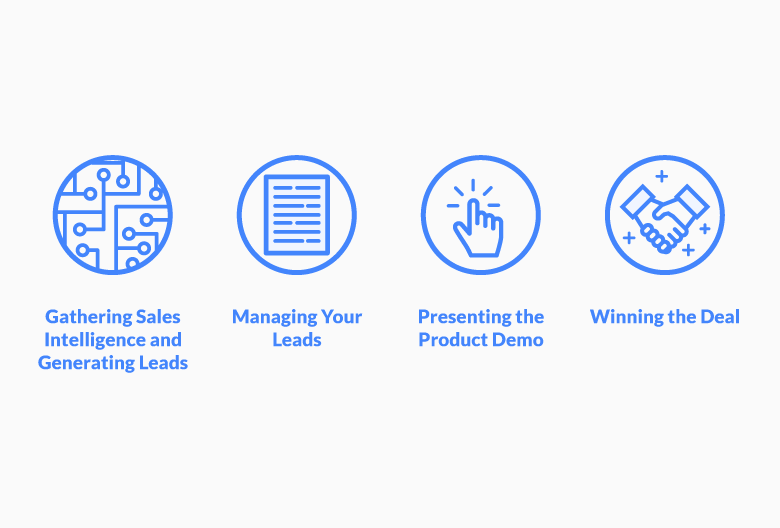 This comprehensive sales stack has everything your startup needs for less than $30 per month. Why do startups love it? This free sales intelligence software speeds up the process of finding new leads. So not only does it help you generate new business, it allows you to learn more about your prospects by providing up-to-date contact information and accurate data about the business. 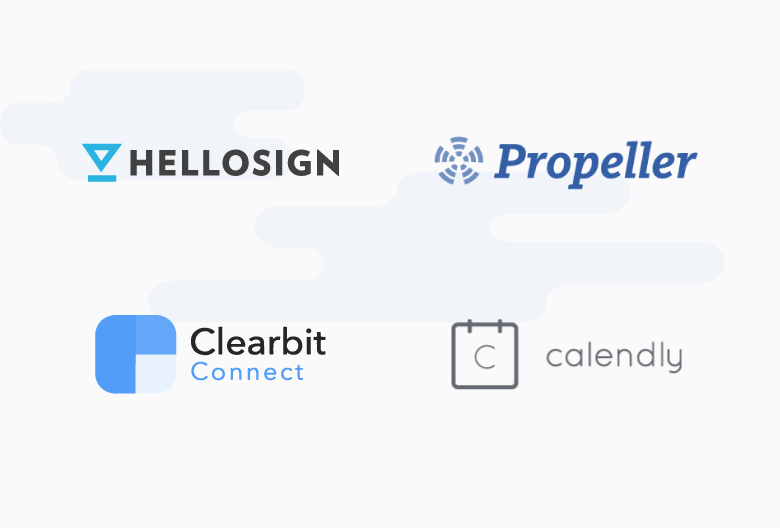 As the only CRM built specifically for selling through Gmail, Propeller integrates seamlessly with many of the tools and apps your team already uses. Our platform makes it easy to manage you contacts, visualize every stage of your pipeline, and generate new leads with personalized cold email campaigns. If you want to spend less time on data entry and focus on selling, Propeller might be just what you’re looking for. It helps improve conversions from phone calls and cold email to actual product demos. By giving your prospects the power to choose a meeting time from several open timeslots in your schedule, Calendly is the perfect solution to scheduling conflicts that can get in the way your sales pitch. This free e-signature software offers a secure and reliable way to sign documents online. Simple, convenient, and legally-binding, HelloSign helps you create and send proposals, get client signatures, and close deals faster. Even if the above tools are perfect for your startup, there are additional apps and platforms you might want to start using as well. Hunter: Quickly find and verify anyone’s email address. Crystal: Discover your prospects’ ideal communication style so you can craft emails tailored to their preferences. Grammarly: A simple plugin that spell checks everything you write online, so you’ll never send another email with typos or poor grammar. Evernote: Take detailed notes, prepare for client meetings with to-do lists, and share notes with anyone on your team. Dropbox: The go-to cloud platform for storing and sharing files that you want to keep accessible and secure. G Suite: A range of handy apps (that sync with Propeller!) to keep you organized, connected and productive. Putting together a strong sales team certainly sets your business up for a bright future – but only if you give them access to the tools they need to excel. As a growing startup, the trick is to find a balance between a budget-conscious sales stack and one that is powerful enough to scale with you. That’s why we suggested the $29 sales stack above. It’s designed to help your sales reps manage their work, meet their quotas, and reach their full potential – all without breaking the bank. Ready to put your $29 sales stack into practice? Get started with Propeller today!